This article is about the world from Super Mario World. For the world from Mini Mario & Friends: amiibo Challenge with the same name, see Star World (Mini Mario & Friends: amiibo Challenge). Not to be confused with World Star. 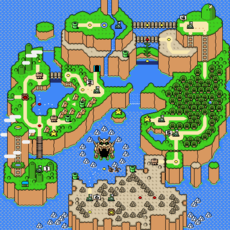 The Star World is the eighth world of Super Mario World that can be reached by one of the five Star Roads. The levels have different colored Yoshis in them, and there is a Yoshi in the beginning of a few of the levels so the player can exit the stage with a new ride. From the Star World, one can also get to the Special Zone. 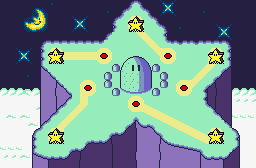 To beat the Star World, the player needs to find the secret exit of each level. Through finding Star Roads and clearing stages in the Star World, the player can take shortcuts in completing the game. The Star Roads link to Donut Plains, the Vanilla Dome, the Twin Bridges, the Forest of Illusion, and the Valley of Bowser. The Star World reappears in Mini Mario & Friends: amiibo Challenge. The moon featured here now appears in the top right rather than the top left. 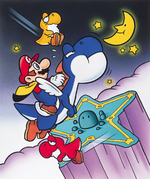 The Star World appeared in at least two episodes of the Super Mario World animated series, although here it was referred to as the Star Path. The Star Path first appeared in the episode "Send in the Clown" where it was used by Mario, Luigi, Yoshi and Princess Toadstool to transport themselves to Neon Castle. In "King Scoopa Koopa", the Star Path is used by Mario and Princess Toadstool to escape from several cave-people (as well as from Luigi and Yoshi), who have been mutated into Chickadactyl-monsters. The Star World's theme is a slowed-down version of the Super Star theme. Superstar Road from New Super Mario Bros. U is a throwback to the Star World. Not only is it star-shaped in appearance, but it is accessed from the main overworld through a star-shaped portal similar to a Star Road. In Super Smash Bros. for Wii U, the Star World's theme can be heard as part of a medley of songs from Super Mario World. ↑ iQue. 超级马力欧世界 – iQue Games. Retrieved December 9, 2016. This page was last edited on April 6, 2019, at 00:42.